Fabulous actors, Kangana Ranaut and Rajkummar Rao are reuniting on the big screen once again post ‘Queen’ in ‘Mental Hai Kya’. The movie produced by Ekta Kapoor is being directed by Tollywood filmmaker K Raghavendra Rao’s son Prakash Kovelamudi. The movie looks like a crazy ride from the first posters being shared on the social media. Have a dekko! Kangana Ranaut might be playing a psychopath in Mental Hai Kya, at least her latest poster is suggesting so. The beauty can be seen taking a bubble bath while toasting some breads and looking at a knife with a deadly gaze at the same time. Her wacky side is already impressing us. In the latest poster of Mental Hai Kya, Rajkummar Rao can be seen cutting an apple with a big knife. His hand is already bleeding. The enigma around his character is now making us restless for the movie. Rajkummar Rao with a tape pasted on his face looks ready to hit the insanity several notches higher in the latest poster of Mental Hai Kya. The movie is hyping our excitement to unprecedented levels with the amazing posters. Rajkummar Rao shared his first look from ‘Mental Hai Kya’ on Instagram with the caption, “Crazy is the new normal. #MentalHaiKya with immensely talented #KanganaRanaut & my fav @ektaravikapoor. Let’s begin this mental ride @ShaileshRSingh @balajimotionpic @RuchikaaKapoor @KarmaFeatures @pkovelamudi @KanikaDhillon (sic)”. 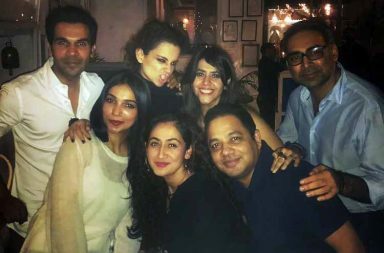 Producer Ekta Kapoor has shared the first look of Kangana with twisted eyes on Instagram with the caption, “It's time to bring out the crazy in you.. Because Sanity is overrated! Here's presenting the first look of #MentalHaiKya starring #KanganaRanaut and @Rajkummar_Rao (sic)”. Ekta shared this collage of the first looks of Rajkummar and Kangana on Instagram with the caption, “accept ur madness with nonchalance! Normal is boring! Take it as a compliment if someone asks MENTAL HAI KYA (sic)”.